This week, the Star Wars Show hosts, Andi Gutierrez and Anthony Carboni, asked for Star Wars Show Art submissions using the hashtag, #SWSArt. I decided to sketch the "reoccurring character," on the show, Pablo Hidalgo. Hidalgo is a longtime part of LucasFilm, member of the Lucasfilm Story Group, and an author. My tweet is embedded below, from 08/24/2017. For this sketch, I used a Staedler Non-Photo Blue Pencil, a 03 and a 1 Sakura Pigma Microns & CopicMarkers, on 5.5" x 8.5" 138lb Canson Mix Media paper. 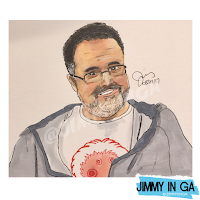 If you would like to see more of my art, the best place to visit is my Instagram account, @JimmyinGA.